While the trip was deeply moving and disturbing, I also felt honored to be invited into the community. 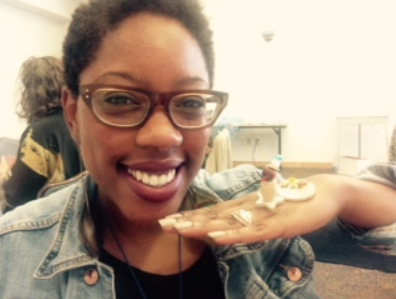 I led a small Talking Suitcases workshop for activists and organizers. The topic they chose was “a favorite childhood memory” – a topic that gives a chance to see a side of people we rarely see – the child inside. I gave some of my own examples, then we set to work. 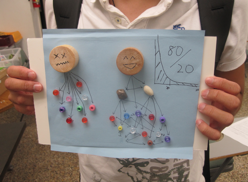 Wood bits, beads, wire, colored tissue, and hot glue – that’s all we used. But the results led to all kinds of stories. One woman made a tiny pony, remembering how she loved to ride them at the fair, though she never had a chance to ride anywhere else. A “tech” guy crafted a miniature bike complete with kickstand – impressing us with his story of a 200-mile bike trip he did in his teens. 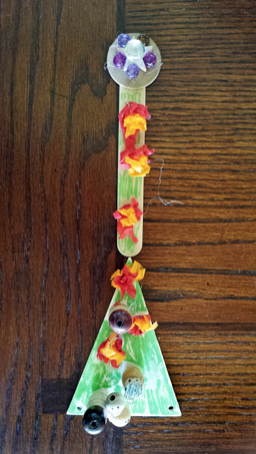 A theater activist made two small boats, and remembered fishing with his grandfather on the river beside their home. Our host, a survivor of the tsunami, made a sewing machine with spools of thread and tiny dress. She remembered her mother sewing all her clothes, and how she loved to sit beside her, filling the bobbins with colored thread. 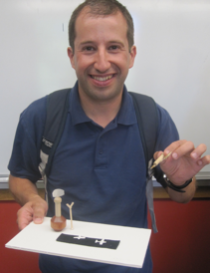 A reserved neuroscientist made a tall block of wood with two blue eyes and a moon shining over it, standing beside a little block of wood. This was a memory from when he was five. He remembers standing outside and a giant bear staring at him in the moonlight; he never knew if it was real or a dream. Everyone seemed to enjoy the session, led in a mix of Japanese and English. Each person had a turn to bring to life a slice of their childhood world. It was a fresh way to see each other, very fun, and drew us together, even though as adults we often seem so different. I’m looking forward to future workshops in Fukushima, if our funding comes through. 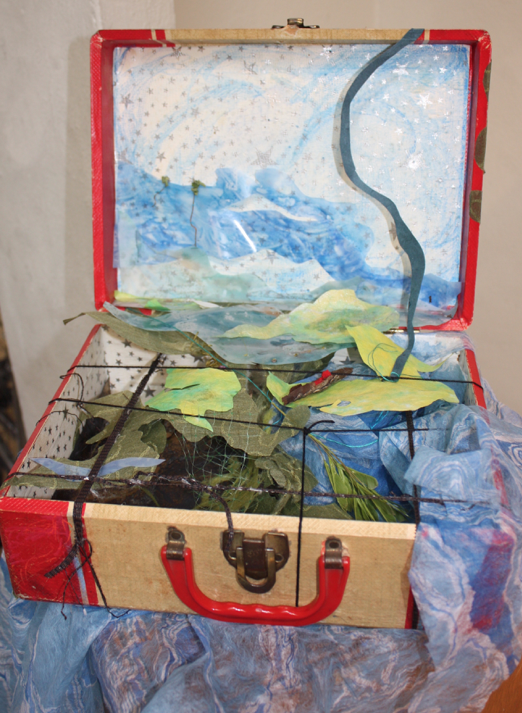 I was invited to bring the Talking Suitcases project to this training as a way to use art as a tool – for people to tell stories about why the river/watershed matters, for them to create visions for stewardship, and to encourage them to use art in their own projects. Jean’s story is about an outing with her family – daughter and granddaughters – on the River. It was a beautiful afternoon, the sun reflecting on the water, when they piled into 2 canoes and a kayak. The girls were only 4 and 1 years old, and hardly ever got this chance on the river because their mother was always so busy. But what made this day special is a wild goose who suddenly appeared on the water (the little wood piece with brown bead) and adopted the family, especially the little girls. It followed them all afternoon, splashing along in the water beside them and staying with them when they stepped out on a sandbar to swim. The girls just loved it, especially 4-year old Abby, who was thrilled when the goose followed them up to Jean’s yard by the river. Now whenever Abby goes out to the river, she is hoping to see “their” goose again. And Jean remembers how everyone let go that afternoon; even her serious, busy daughter. Everyone just laughed and played. Patricia tells of the beauty of canoeing with friends, and seeing sandhill cranes and herons right beside you in the water. She’s had reunions on the water with a group of friends for more than 30 years. Jim tells about working with a group trying to purchase a cranberry bog to prevent it from discharging pesticides right into the River. He finally got one congressman to send an aide out to investigate. The aide was not interested at all, till Jim took him out to this little bridge over the St. Croix. Standing on the bridge looking down into the water, suddenly they spied what looked like a 4-foot log floating down it. Only it was no log – it was a sturgeon – a rare fish known as a “living fossil” because it dates back to the Triassic period some 245 to 208 million years ago. The aide was blown away and couldn’t stop talking about it. He went back to the legislature filled with passion for the river and desire to protect the River. Robin’s story takes place at the University of Wisconsin at River Falls, where she took her class out to look at the campus with the groundskeeper. He talked about the impact of water and chemicals and how it was showing up on a campus that is more and more manmade. And then he took them to his favorite part of the campus – a forgotten corner of scrub oaks. Unlike most scrub oaks, these had grown tall, and were probably over 100 years old. They created a kind of natural oasis that was cool and inviting even on a hot summer day. It was amazing to find this ancient grove unnoticed in the midst of their everyday life. Could we have more such spots in our lives? The groundskeeper in the grove of scrub oaks. Vision Boxes – St. Croix River Stewards’s visions for the future Vision #1: Outdoor trips with students learning about the River, on pontoon boats! Vision #2: Getting rid of lead in our land and wildlife: no more lead shot, no more lead fishing tackle! 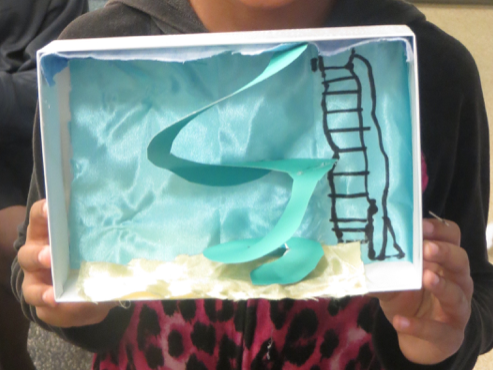 Vision #3: Children learning about the river through a novel about adventures on the River. Vision #4: Teaching the importance of the River’s Edge – dangers of erosion and chemical seep, learning about solutions – rain gardens, native plants. 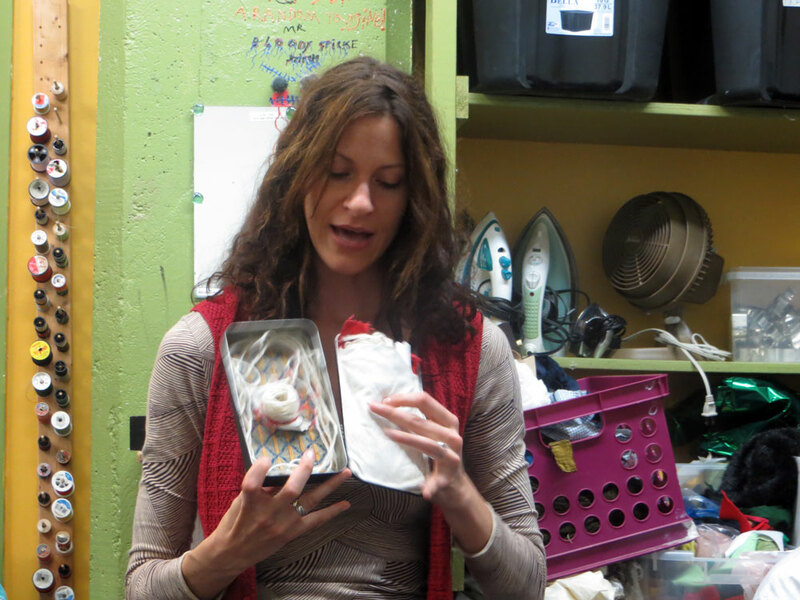 Talking Suitcases workshops often start with a question like “What is precious to you? “This is a great way for people to reflect on who they are and what matters to them, and to get to know each other in a group. Next, we usually create an object about a happy memory. This helps prime the pump for remembering stories in more detail and a time when we felt whole and at peace in the world. But it’s important to talk about difficult times too. How we handle challenges defines who we are, as well as the happy times. Sharing these stories can bring a group together, and underline that we are not alone in our hard times; everyone struggles. This was especially important in the Talking Suitcases workshops I led at Asian Women United’s domestic abuse shelter, House of Peace. Above is a picture of one woman’s art about her home situation. This young woman, who has a delightful laugh and sparkly eyes, was 8 months pregnant when she came to the shelter. In the scene above, she is kneeling on the floor at her husband’s feet. He is brandishing a knife. She is begging him not to kill her. As we passed the object around the circle, each woman held it in her hands and looked in at the figures. Many of us had to wipe away tears. In fact, many of us cried during that session when each of the seven women showed an art object and told the story of some terrible challenge she had had had to face. But the great thing was that those women were all there, at the House of Peace. They had each been desperate but brave, and managed to leave that situation, and arrive at a safe space with their children. This story object was a testament to their bravery and to what brought them together in that shelter. I learned later from Nhia, the advocate who assisted me, how important it is for the women to have the chance to tell these stories. For some this was the first time to talk about it, and talk about it in English. 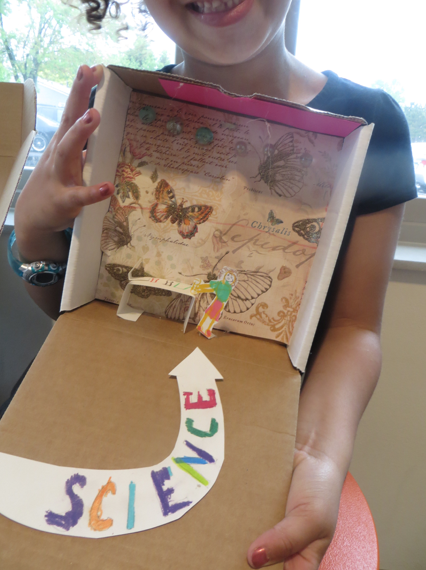 Having the scene illustrated in their box and sharing it in such a supportive group was really powerful. Nhia pointed out that it is good practice for them because in the future, they will have to tell these stories in court. Also, by sharing these stories and learning to speak to each other in their limited English they begin to build the bonds that can help them in the future. Some of the women did end up living in an apartment together – how great a support that can be for them. Creating art about their stories helped these women speak up and experience the support of a community. Their story objects gave vivid shape to their memories and experiences, and helped them tell the stories that are so difficult to bear alone. Their final Talking Suitcases object were about a dream for their future. Those objects were full of joy and imagination; they seemed to shimmer with laughter and hope – in stark contrast to the horrific situations they had so recently escaped. Talking Suitcases are a terrific prompt for writing. They offer a natural focus on something that people care about—and have had the chance to reflect on quietly as they worked to give it shape as a 3-D scene or object. Working with 4 groups of youth (5-14 yrs) and teens (15-19 yrs) in two sites in the Stillwater area, I asked the young artists to talk and write about their work for display in the upcoming arts festival. Some wrote quickly, others took their time and went deeper. Some wrote directly, and others, I recorded in an interview, then wrote down what they said. 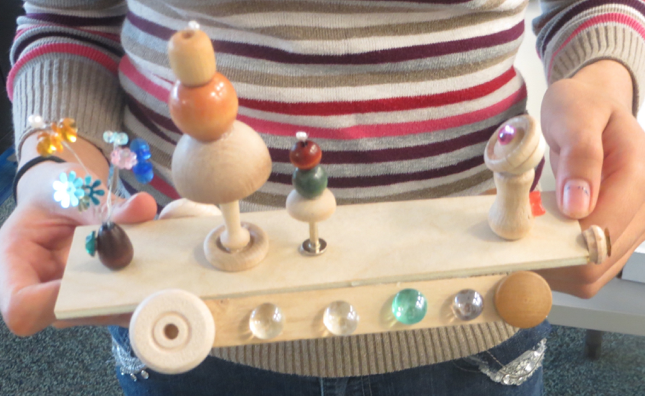 Everyone was eager to tell about what they had made. In a classroom situation, we could have easily written much more. Why I made this is because I love cats. They are my life. I want them by me all the time when I sleep, when I watch TV. I love them. Go cats! I made a science box. It has all sorts of things with science. There is an arrow pointing to science cause there’s book about science so you can read about it and there’s some chemicals and another book and a table and that’s me doing chemicals…It’s me in the future when I grow up; I’m going to be a scientist. I made a box dedicated to what’s my favorite thing to do in the summer. I love water parks and that’s what I always do every summer. So I thought I would do one about water parks. Inside my box, you can see there’s a sky and the sand is right at the bottom. People come and splash into the water. I went on a water slide, on the family ride with my family, only once by myself – I went backwards and forwards and it was fun. Mirror Box—People see what they want to see not a whole person – inside things that most people don’t care to see—don’t take the time. I wish people would see things like I could be a leader. I wish to be free from all the stereotypes and society’s rules. Inside I’m beautiful…amazing…maybe. “The Road to Happiness” A car with two figures. My daughter and I, riding this car to happiness. I want to be with my daughter all the time. Share everything with her. Bumpy, smooth, and curvy roads. Together we will be happy and will never give up! Hi everybody, my name is Jesus and this is my talking suitcase. Inside is me—I’m happy because I’m proud of myself. In one of the boxes, it shows that I love going shopping and that I love music. 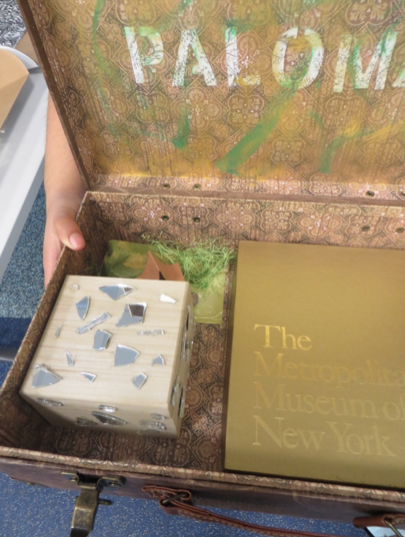 But inside the box it shows that even though I could be feeling dark inside there’s something shining in there. In my white box, it shows that my dream for the future is going to Paris with my friend. And this is me. 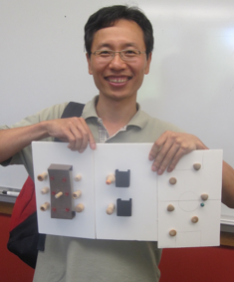 The week of June 15, I had a treat–I took an experimental drawing workshop at MCAD. So fun! We started with a sketchbook; but not your old familiar pencil-drawings-only one…no! This one could be anything–all kinds of media, and even sticking things in there that you pick up on your walks. …and by the time we went to Silverwood Park the next day, I had a bunch of pages already. At the park, we drew some blind contours, then tried to draw the feeling of textures of the grass and leaves. Next I drew damselflies on the water, then the water and weeds around them, and then…bam! I was leaning over the bridge to look at a turtle stuck in the surface green glop when I discovered how fabulous the water itself was. 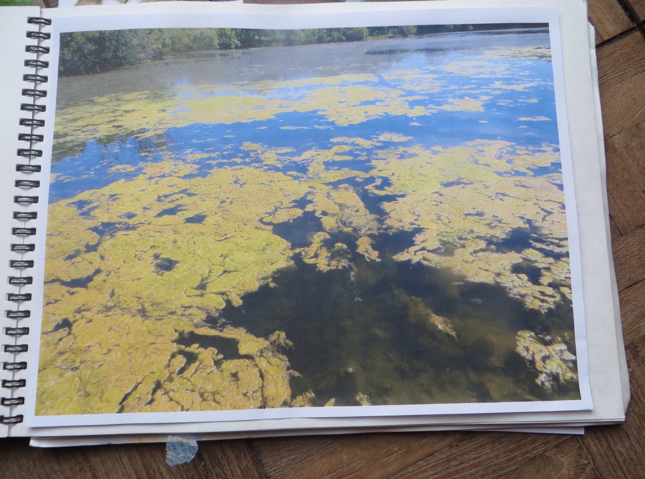 (Shannon Brunette said it looked kind of dreamy) On the surface was reflected the blue sky and clouds, and then there were the gloppy green surface weeds that looked like thickened cloud clusters, and then beneath the surface the murky dark with shadows of fish and seaweeds. 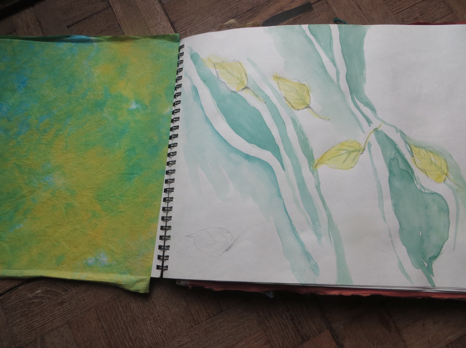 I took some photos and began drawing the cloudy green clusters, then the strings and tangles of stuff on the surface, and painting the colors and their interactions. Next step: make a drawing on something 3-D, so I chose a suitcase, of course–a little red one. 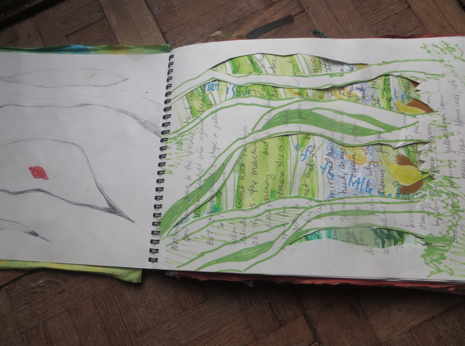 What I did for the next day or two was interpret the layers of Silver Lake–the luminous sky reflections, the clouds of greenish glop and seaweeds, and the darker mysterious depths in papers, paint, drawing, fabrics, and thread, inside and outside the suitcase. I used my sketchbook to help me. I had a great conversation with my tablemate Bethany who was working in a stricter minimalist mode–in black and white rectangles and lines. I decided to add our conversation right into the suitcase–as a grid of black string that represents her structured approach. I like how the grid kind of holds the looseness in place, and marks out a clearer view of surface and depth. I Still Remember Their Stories! These are presentations that I’d never remember without these prompts–it’s amazing how the 3-D visual object can really help keep the story alive in your mind. 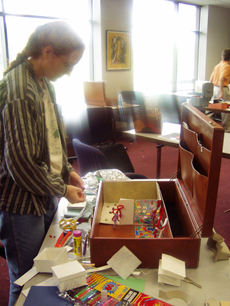 Another thing I remember from that class–we took a field trip to Washburn High’s summer school and my students presented some Talking Suitcases objects. Now these were two VERY different populations interacting! My university students were very apprehensive; sure that American H.S. students would be rude and make fun of them. But as you can see in this photo, when they told their stories and shared their objects the students were actually pretty interested. Though it was challenging, they managed to get some real interaction going and give pleasure too. The Talking Suitcases object gave structure to the interaction and added some fun too. 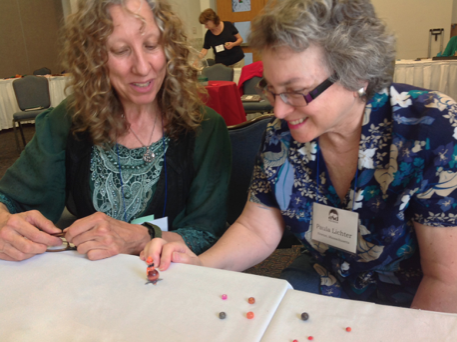 On June 8, I led an art-making workshop called “Tiny Objects of the Dream” in Virginia, at the IASD conference at Virginia Beach. I asked participants to reflect on a dream, and select one or two central images. 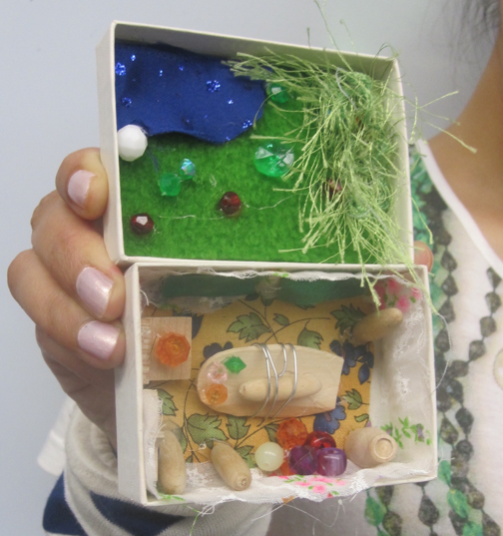 Then they made tiny 3-D tiny “seed objects” to represent the image–from wood bits, beads, wire, paper, and hot glue. The “seed” objects don’t have to look realistic, but they should show the essential elements of the image from the dream. Next, you tell the dream to a partner, using your objects. The partner responds with observations on the object and a question. The final step is to make a new object in response. People created a wide array of “tiny objects”–from a little figure with wings, to the disheveled floorplan of a house, to a series of small flames in a row, to an abstract pattern, to a full-scale wearable necklace of tiny objects. What draws your attention now? What does the object or image want or need? What did you discover in this process? The results are sometimes surprising and unexpectedly powerful. Awhile ago, I led a Talking Suitcases workshop with Interact Center for the Visual and Performing Arts. 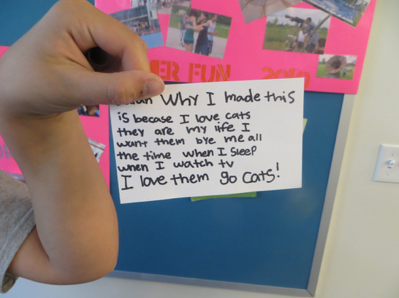 The workshop’s theme question was: What’s the best thing about you? So often people draw attention to limitations rather than strengths, so this was a chance to showcase our gifts. Both artists and staff participated–each transforming a slim black metal box into a piece of art that revealed an inner truth. It was fun to try to guess what quality people chose about themselves. In the process, we acknowledged lots of strengths and beauty–and were treated to a heartfelt song, images of magical clouds, a hot air balloon, cats, and lots more. Billy remembered the story of when he first came to Interact, having been rejected everywhere else, and was welcomed in and invited to clown around. 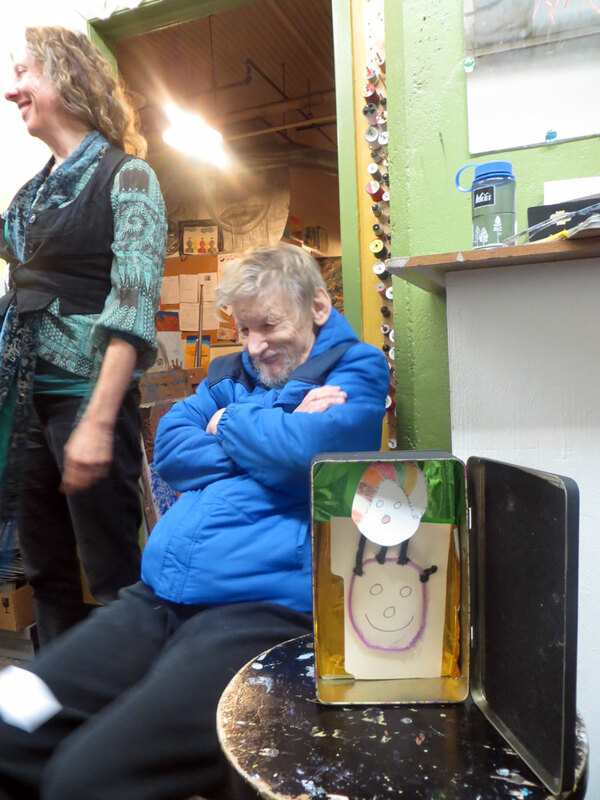 Below is Billy and his clown box, and Jamie, a teaching artist, revealing her amorphous creativity.